Next Friday (9th November, 11am EST), the Pistoia Alliance will be hosting a webinar describing their App Strategy. Yours truly will be the presenter. The webinar will describe the three planned phases of the Pistoia Alliance App Strategy. Phase 1 is scheduled to go live in January 2013, and will deliver the Pistoia “AppStore”. Since this term gets used for quite a lot of different purposes these days, specifics are required. The Pistoia AppStore uses a piece of software provided by AirWatch to provide a list of mobile apps that can be downloaded onto your phone/tablet, much like what you’re accustomed to with the iTunes AppStore/Google Play/Windows phone store, etc. This sounds like quite a grandiose project, and indeed it is, but the first step is relatively modest, because the store will only list apps that are already hosted on the official appstore for that platform (iTunes, etc. ), which is where they will be obtained from. 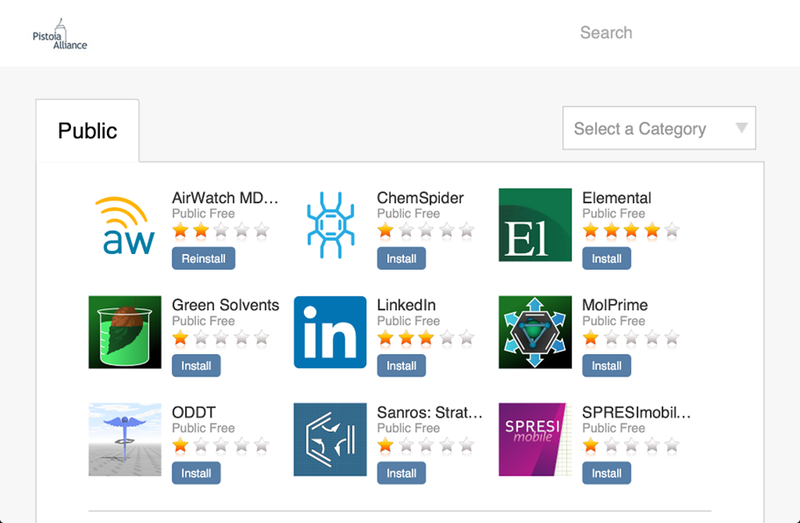 So in effect the Pistoia AppStore is acting as a catalog for apps that have relevance to lifesciences R&D. Each of the apps will be accompanied by a discussion forum, and we will be encouraging producers of apps to become actively involved in interacting with the user community. Phase 2 is more ambitious: we plan to solve one of the most pressing problems for a segment of app creators, that being that the public app stores are very heavily skewed in favour of consumer apps. Life sciences R&D is a vertical market. Selling a product that can help several hundred people discover drugs more effectively is very, very different to selling a trillion copies of Angry Birds, and at the present time the options for delivering apps do not reflect this. The Pistoia AppStore will be extended so that it can host apps directly, and under conditions that provide the vendors with much more control over who can use them, and how they are monetised. We have to make sure that this can be done without stepping on any toes, and getting the legal issues worked out may operate on a different schedule per platform (e.g. Android is quite unencumbered, but Apple devices are much more strictly controlled). Phase 3 is even more ambitious still: we are working with TM Forum and some of its member organisations to design and build a cloud-based environment for offering support for apps. One of the main objectives is to deal with problems that apps have when they need to work with “big data” (for an app, any document larger than about a megabyte is “big”). Providing an API and back-end calculation services and storage removes a critical rate limiting step that makes mobile apps inappropriate for certain types of cheminformatics and bioinformatics workflows. With some well thought out server infrastructure, that can all be fixed, which is what this project is about. If you are interested in apps for lifesciences R&D, by all means tune into the webinar. Or if you miss it, we’ll make the slides available afterward, and possibly audio as well.